Niche. Clean. Indie (no pun intended). New. Fresh. Anyone – particularly good for dull skins, mature skins. It’s a gel-like texture – doesn’t absorb. I apply to dry skin, add a little water, massage in and then flannel off. I’ve had it for about 6 weeks. A lovely cleanser that does what it says on the box. This is about the closest I get to a foaming cleanser. If you’re looking for something to wean you off your traditional ‘foam’ products, this is one to consider. Much more gentle, but still efficacious. Although they say this will remove makeup, this is an obvious morning or second PM cleanser for me. I wouldn’t waste it using it to remove makeup. Smells lovely and fresh, leaves skin soft and comfortable. Nothing really. Good size, gorgeous packaging and excellent contents in the bottle itself. I wouldn’t use daily if you were really dry, you’d be better off with the Rosehip Cleanser IMO. Nice. Basic, clean and fresh with just enough information and no ‘faff’. And full ingredient listings. Absolutely. I bought this along with most of the range from ABeautifulWorld.co.uk and would repurchase. 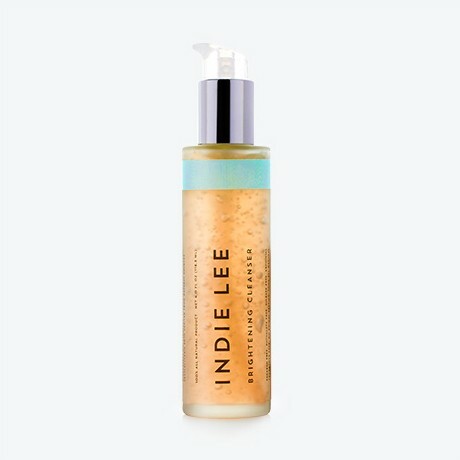 Indie Lee Brightening Cleanser is £29.95 or $32.00 and available from abeautifulworld.co.uk and indielee.com which ships worldwide.